Il Mito. Photo from Facebook. 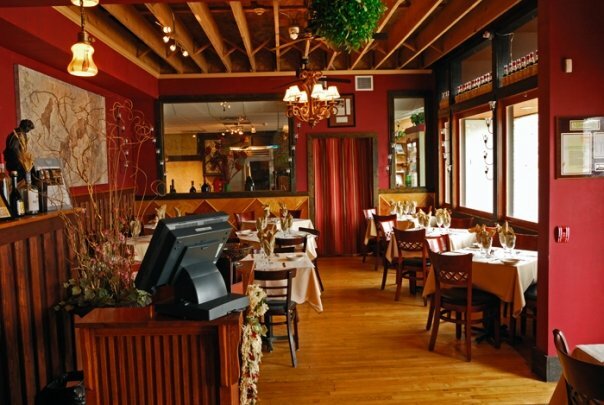 Back in the 90s, when I thought Cataldo’s on Brady made the best lasagna in town, I ate there often, carried the lasagna home for the family, and took friends to show off a classic Milwaukee Italian restaurant. 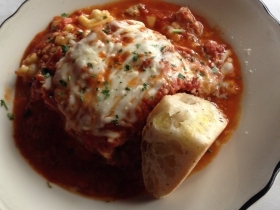 Many years later, I discovered Il Mito on West North Ave. and Chef Michael Feker’s lasagna. From the Primi Pasta menu at lunch, a friend and I feasted on Lasagna Bolognese, multiple layers of pasta covered with Wisconsin cheese, Chef Fecker’s meaty Bolognese, and roasted mushroom béchamel sauce, topped with tomato sauce and more cheese. Three sauces and all that cheese made a party in my mouth, or more accurately, a “festa.” Hands down, the best lasagna I’ve ever tasted. 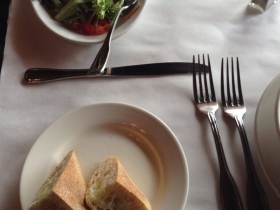 It came with a choice of soup, zuppa, or mixed greens; we sampled both. Broccoli zuppa had bits of crunchy broccoli floating in it along with hot red pepper to give it heat, and a cream base making a rich flavorful bowl of delicious. 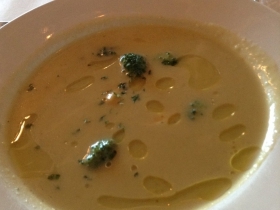 What separated it from the average everyday broccoli soup was the absence of cheese. The chef finished it with a drizzle of olive oil to remind us this restaurant favors Italian cuisine. The mixed-green salad came with an assortment of market-fresh greens dressed in a light vinaigrette. For an additional $2.00, people with gluten allergies can order the lasagna with hand-cut house-made gluten-free fettuccini. And if that cheesy lasagna sounds like too much food, diners can order the same Bolognese sauce over spaghetti for a lighter meal. The chef makes this house special with a combination of Italian sausage, choice beef eye of round and chicken, slow-cooked in a wine and tomato reduction. We couldn’t locate any chicken; somehow it seemed superfluous in that rich meaty sauce. So many choices on the Primi menu left us with no desire to move on to the Secondi or entrée menu. If we did, we could have sampled beef short ribs with gorgonzola polenta, turkey scallopini, butternut squash and broiled broccoli, the fresh daily catch with leek and caramelized Brussels sprouts, or chicken Parmesan with grilled eggplant, roasted tomatoes, and fresh basil served over fettuccini alfredo and sautéed spinach. Several years ago at Il Mito, I had a dish that included that gorgonzola creation. I clearly remember the perfectly presented polenta with a hint of butter and cream along with the cheese. That’s the happy memory that brought me back in 2016. 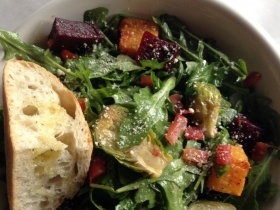 The only disappointment at a recent lunch came from the salad menu, Verdure alla griglia, roasted beets, Brussels sprouts and parsnips tossed with lemon anchovy dressing and arugula. It had too much salt, too much arugula, a scant supply of those promised beets and though we dug deep, no sign of parsnips. The Margarita Pizza, a flawless execution of the pizza that many consider the Queen Mother of the species, left us wanting to return to sample again from the Pizza menu. Just enough fresh mozzarella topped a crisp, medium-thin crust with plentiful roasted tomatoes, shredded basil, and freshly ground pepper. For adventuresome diners there’s pizza with alfredo sauce topped with fresh clams, confit of fennel, grilled broccoli, and pine nuts. 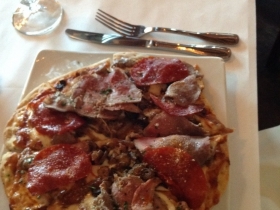 Carnivores will want to order the pizza with shaved black angus beef, Italian sausage and pepperoni, along with caramelized onions, two cheeses, and roasted tomato sauce. If the pizza doesn’t seem quite enough for a meal, the chef throws in eggplant fries and soup or salad. 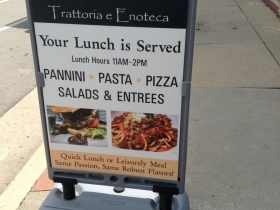 The day we were there, they were out of the fries but we enjoyed the replacement, an al dente pasta salad. The Italians have a way with eggplant, or melanzane, as evidenced in the Panini de melanzane alla parmigiani. The eggplant had a crisp exterior that held the delicate flavor of the vegetable while oven-dried tomatoes and roasted red peppers added depth, and melted fresh mozzarella fused it into a rich, yet healthful sandwich. There was just enough of everything so that when you bit into it, it didn’t ooze all over your face, unlike a couple of sandwiches recently sampled at other establishments. It’s also served with eggplant fries, more eggplant, but why not, plus house salad or soup. 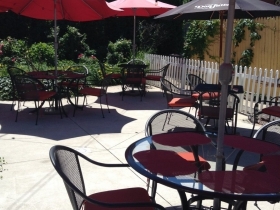 Patio at Il Mito Trattoria e Enoteca. Photo by Cari Taylor-Carlson. No one leaves Il Mito hungry and that’s a promise from a customer who has followed Chef Fecker around Milwaukee since he opened the original Il Mito on Virginia St. in Walker’s Point in 2000. I was a huge fan of Los Mitos, the downtown Argentine-inspired restaurant where Fekker served several varieties of chimichurri and I was a frequent customer at Il Mito East on Juneau where the globally-inspired brunch menu and the Bloody Mary bar called to me often on Sunday mornings. 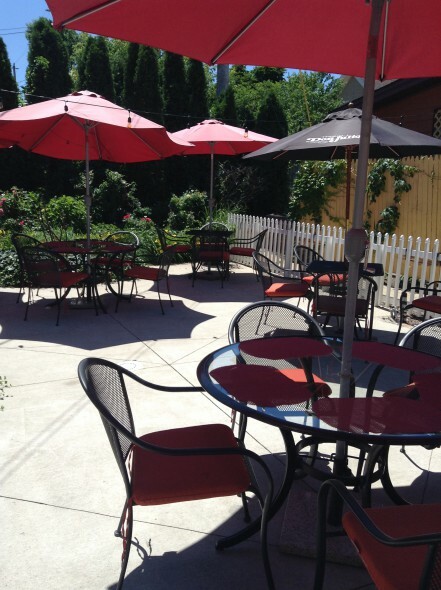 Now Il Mito on North is the sole repository of the chef’s culinary talents. Fekker has brought some of that brunch menu to North Ave. On Sunday he serves French roasted duck quiche, an Italian frittata with asparagus and sun-dried tomatoes, a Spanish omelet with roasted peppers and caramelized onions, and from the Orient, sticky rice with the fresh catch, spinach, and a poached egg. A private patio ringed with flowers, hidden behind the restaurant, adds an additional inviting space to dine al fresco. I can taste the passion behind the food at Il Mito. 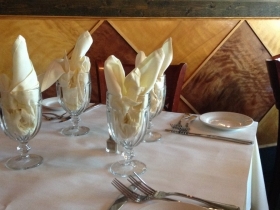 In my opinion, Chef Fecker has perfected the art of delivering not just Italian cuisine, but a potpourri of global foods that have delighted many on West North for sixteen years. Location: 6913 W. North Ave.